This guide offers suggestions to help you get results when you have a problem with the purchase of goods or services. It explains the proper way to make a complaint, and also discusses using government agencies, consumer groups, lawyers, and small claims court. A sample complaint letter and a list of complaint handling agencies are included. Everyone has consumer rights. You have the right to know what you will receive before you pay for a product or service, obtain what you pay for, complain when you are not satisfied, and get your money back when you have a legitimate complaint. There are no magical ways to get action on a complaint, but nothing will happen unless you complain and demand action. This publication offers suggestions to help you get results when you have a problem with the purchase of goods or services. “The squeaky wheel gets the grease.” This old proverb means that noise gets attention. If you don’t let a merchant or vendor know you are dissatisfied with their goods or services, you have no chance of resolving the problem. First, ask yourself if your complaint is legitimate. Why are you dissatisfied? What went wrong? Is it a question of losing money because goods or services you received were not what was promised, or was there even outright fraud? Or, did a representative of the company treat you rudely? Taking the time to consider whether you have a valid and timely complaint will save you time and effort. But, be sure to check to see if there is a deadline for making your complaint. The first step should be to take your complaint directly to the business before you take other action. Often, the problem can be resolved quickly by doing do, so don’t forget to ask to “escalate” your call if the customer service representative is not helpful. Ask politely if you could be transferred to someone with the authority to help resolve your complaint. If it is a small company, ask to speak with the owner. Obviously, you can’t resolve a complaint about fraud or a scam by contacting the party that ripped you off—the scam artist is probably long gone, and it isn’t advisable to contact fraudsters anyway. However, you should let the appropriate authorities know when you have been a victim of fraud. There is a chance that they could recover your money, and at the very least you will help prevent other consumers from falling victim to the same scam. Complain in a timely fashion. Prepare a folder or file to keep documents and notes about your complaint. Write out three or four sentences that describe your complaint clearly and concisely. Be patient and don’t lose your cool. Seek assistance from a third party. what you want the business to do to resolve the problem. If you are not sure what your rights are or how to proceed, do an Internet search to learn more, or contact a consumer group and discuss the situation. Talking with a qualified organization may help you decide how to handle the problem, and many agencies have publications that explain consumer rights and how to resolve complaints. You can consult the Consumer Action Handbook, a free guide that includes information about your consumer rights and lists many consumer protection agencies. From this page you can order a printed copy or download the PDF version. any other papers you received from the company, including agreements, instructions, receipts and billing statements. If you signed a contract, read it carefully and ask the company for explanations of anything you don’t understand. The contract or warranty may limit your options or provide you with certain rights. Make sure you have done everything that you were supposed to do to live up to your part of the agreement. Decide what you want from the company, such as repair or replacement of the item, a refund, an exchange, a credit, a correction of the company’s records or the payment of damages. Consider whether a compromise would be acceptable. It may be easier to resolve the complaint if you agree to a settlement that falls short of a full refund. The sooner you complain, the better your chances are for a satisfactory settlement. In some cases, especially billing disputes, the company may not be legally liable if you fail to complain within a reasonable time after you first discover the problem or receive the bill. That is why it is important to read all bills and statements as soon as you get them. Some store refund policies allow you to return items if you do so within a few days. If you wait too long to return the item, you will lose the right to get your money back. In addition, it can be difficult to defend yourself if you wait a long time to complain. If you buy a television and don’t return it for three months, you may have a hard time convincing the store that it didn’t work when you first tried to use it. The first step in complaining is to clearly present your problem. Failure to communicate effectively often makes it difficult to resolve complaints. Have all relevant information at hand when you contact the company, including: a description of the item; your account number or other facts to help the company identify the transaction; your receipt, billing statement or cancelled check; and a clear and brief explanation of what is wrong and what you want the company to do. Do not get emotional: Speak calmly and politely. Think about how the person you are speaking to will react. If you raise your voice, that person will probably get angry and yell back or simply hang up. Handling complaints can be a tough job. If you make the complaint handler’s job harder by getting angry, that person is likely to respond negatively to you. Make notes about all conversations you have about the complaint, including the time and date of your calls, names of everyone at the company you spoke to and what they said. You can complain by phone, in person, or in writing by email or mail. Phone or email first to tell the company about the problem and to try to resolve it. You should be able to learn pretty quickly whether the problem will be resolved. Go to the company to return the purchase, or if there is a need to meet with someone to examine the item, receipts or statements. Complaining in person helps to force the issue, but is not always necessary. Ask a friend to go with you if you are concerned about being harassed or want a witness. Sometimes problems can be resolved with one call, email or visit. You may learn that you are not using the item properly, or that the company is willing to give you a refund without an argument. But when you realize that your attempts to contact the company are being ignored, or the company refuses to help you, start putting your communications in writing. Sometimes businesses ignore complaints until they see them in writing. Even if you email, it’s a good idea to print out a copy of the message and send it through the mail. Always send your hard-copy complaint letters certified mail or “return receipt requested.” This way you will have a record that the company received your communication. let the company know you are serious about the matter. Remember: Always send your complaint letters certified mail or “return receipt requested.” A mail receipt will provide proof that delivery was made. Make sure you do not delete emails you send, but save or copy them for future reference. You may need certain documents, or evidence, in order to win your case or prove you paid for the item. These can include your receipt, credit card statements, screenshots of the company’s website, repair orders and/or the warranty. Companies may demand proof of purchase before settling a complaint or fixing an item under warranty. Note that you don’t need to mail in a product warranty card in order to claim your rights on a product that is still under warranty—a receipt and the barcode (Universal Product Code, or UPC) from product packaging is enough. If your purchase was made online, you might be able to print another receipt from the company’s website. Never send originals of receipts or checks to the company or any complaint-handling agency—always send copies. Copies of your emails or letters can also be very helpful. If the firm claims it never heard from you, copies of letters with return receipts or proof of delivery, or emails with a date header, can help you resolve the problem. If your first attempt at complaining fails, contact someone higher up in the company. If the salesperson can’t help you, ask to speak to a supervisor or store manager, and then the owner or the company’s headquarters. Larger companies often have customer relations or consumer complaint departments that you can contact for assistance. If all else fails, ask to be connected to “customer retention,” a department responsible for keeping customers. Don’t hesitate to send complaint letters to the owner, president, chief executive officer (CEO) or general counsel of the company at its executive offices. These officials should send your letter to the appropriate person, and may take steps to resolve the dispute promptly. Higher-level officials are sensitive to the firm’s image and often are more willing and able to find a solution to complaints. Top executives do not like hearing from consumers, and top-level staff often intervene to solve problems quickly, before they reach the big boss. To get the name and address of the president or executive offices, put “CEO” and the name of the company in a search engine. Or call any office of the company and ask for that information. All companies, foreign and domestic, are required to file registration statements, periodic reports and other forms with the Securities and Exchange Commission (SEC) electronically through EDGAR. You can access this information for free. The reports are a good resource for finding the address and phone number of a company’s headquarters or general counsel. Other sources of this information are Hoovers, Google Finance and Yahoo Finance. Call the executive’s office by dialing the general number for the company and asking for the executive by name. In most cases, you will get through to someone who will take your complaint seriously. If you cannot get through during business hours, try calling the number after business hours to see if it has a directory of employees you can search by name. Leave a short but informative message about your problem and ask for a return call. Sometimes you encounter a company that makes complaining very difficult. It may say, “The person you need to speak to is not in the office today, call back next week,” or “Leave your number and we will get back to you.” This may be a sign that the company is stalling you. If you are not being treated seriously, it might be time to take your problem to a person higher up in the company, complain to a government agency or consider legal action. If you cannot find a phone number or you prefer to communicate by email, Consumerist offers some tips for finding or figuring out executives’ email addresses . Government agencies will not always intervene to settle your case, but some will contact the company to open up communication. For example, if you complain to the state public utilities commission about a telephone company, it might ask that company for an explanation of its position. A government financial services regulator might contact your bank to ask for its side of the story. State attorneys general (AGs) and municipal district attorneys (DAs) handle many cases that do not fall under the jurisdiction of any other government agency. Some district attorneys have units that offer consumer complaint mediation. No agency can force a business to settle an individual’s complaint, but the government’s interest in the case may convince the company to resolve the dispute. Businesses that ignore most complaining consumers often settle cases that are sent to government agencies (or consumer groups, business associations or action lines). Government agencies can be excellent sources of information about consumer rights and the laws and regulations that companies must follow. If you are not sure whether a company has broken the law, call the appropriate government agency and ask for information about your rights. Many businesses are directly regulated by government agencies, such as a department of insurance or department of banking. These agencies receive complaints about the companies they regulate and investigate allegations that those businesses have violated the law. The agencies depend upon consumers to alert them to companies that are engaged in illegal practices. Even if the agency doesn’t help you resolve your complaint, it might be able to use your case to stop an unfair business practice. If your complaint involves an out-of-state company, you may still be able to obtain assistance from government agencies in your state. You can also contact a federal government agency to complain about out-of-state firms. Government agencies usually prefer that you complain by email, phone or mail—not in person. Most are not prepared to help people who walk into their offices without appointments. Some have special complaint forms for consumers to use. To make sure you are complaining to the appropriate agency, visit its website or call before submitting a complaint, or ask a consumer group which agency to contact. To find the appropriate agencies, consult the Consumer Action Handbook, a free guide. From this page you can order a printed copy or download the PDF version. If you don’t find the information you are looking for, look for the names, phone numbers and addresses of government agencies in your phone book. A special government section in most phone directories lists local, state and federal agencies. When you have done all you can on your own, consider whether an organization can assist you. In many areas, chapters of the Better Business Bureau (BBB) assist consumers with certain complaints. You can file a complaint with the BBB. you may be represented by people with sufficient expertise, sophistication and resources to cause problems for the business. Action lines are volunteer programs, usually run through newspapers and radio or television stations. (Callers to action lines are not placed on the air.) They give assistance to people who are having difficulty resolving complaints. They can contact a business on your behalf and try to work out a solution. You may know of a local station that features consumer complaints. To learn if there is a Call For Action-affiliated action line that serves your area, visit Call For Action. Seek advice. There are many sources of information and advice. Many consumer groups and action lines offer free consultation about consumer problems. Some government agencies provide advice and information concerning complaints against the companies that they regulate. There are many publications that provide helpful suggestions about resolving consumer problems. Sue in small claims court. Small claims court is an appropriate place to settle many consumer cases. Contact a lawyer. Usually, the money involved in consumer cases is not enough to involve a lawyer, and legal actions can take years to complete. But a lawyer can advise you about your legal rights and options. Conduct a consumer picket. You can hand out information about your case to the public while you stand in front of the company’s store or offices, as long as you do not block traffic, break any laws or say anything in your handouts that you cannot prove. Use social pressure. The opportunity to shame a business publicly has grown in the age of the Internet. It’s possible to post your story online in reviews, blogs, comments and social media such as Facebook and Twitter. Many complaint websites allow you to post public complaints or to write a review of the business. (To find them, do an Internet search.) As with a consumer picket, never post anything you cannot prove or defend in court, as you could face legal action from the business if you go too far or make false claims. However, this avenue can be effective, as a large number of companies monitor the Web and social media in order to resolve complaints before they create bad publicity or damage their brands. Create a website or a social media page. Disgruntled consumers have gotten very creative and set up “corporate hate websites” targeting companies for bad practices. It is important to remember that the company may try to take legal action against you, and even though you are probably within your rights of freedom of speech, defending yourself could be costly. (To protect yourself from any lawsuit, make sure you have adequate liability insurance on your rental or homeowners insurance policy.) Most of these “hate sites” accept posts from other disgruntled consumers. You can stop payment on a check or an electronic payment from your bank account. This is a traditional consumer remedy, but it doesn’t work in every case and it may not end the dispute. Stopping payment on a check means that you tell your bank not to pay a check that you wrote, but there is no guarantee that your bank can stop a payment. Most banks charge fees of $30 or more to stop a payment. Stop payment orders generally expire after six months. When you stop payment, the company you gave the check to will be unable to get any money for it—unless it cashed the check before you stopped payment. Businesses often cash checks immediately to prevent customers from stopping payment. To stop an electronic payment from your bank account, you will need to notify your bank at least three business days before the transaction is scheduled to be made. (Again, a stop payment fee is likely to apply.) This notice may be made orally or in writing. However, if the notice is made orally, the bank may require you to follow up with written notice within 14 days. If you don’t provide written verification of the oral notice when required, the oral stop payment order may expire. If you gave a merchant preauthorization to take money from your bank account, you need to revoke the authorization with the merchant. Pre-authorized withdrawal agreements are between consumers and vendors—the bank can’t cancel them until you notify the vendor/merchant. Write directly to the vendor/merchant to request that no further money is taken from your account. It can be difficult to stop payment on a recurring debit if the company won’t cooperate. You should provide the bank with a copy of the letter and inform the bank that you no longer authorize these charges and you have notified the vendor/merchant. Keep a copy of the letter for your records. Once you stop payment, you should immediately tell the company (or person) what you have done and why. You can do this by phone, but you should also write a letter to create a written record of your position. (If you fail to explain the situation, the company might assume that you are trying to take the item without paying for it.) When you stop payment for a purchase, you should return the item to the company. Contact your credit card company. If you paid by credit card, the bank that issued the card may be able to help you resolve the problem. Make sure the bank receives your notice of billing error within 60 days of the monthly statement containing the unauthorized charges. You may be required to submit your dispute in writing. Your card issuer will investigate the case and may decide in your favor if it believes you have a legitimate complaint. While it is investigating, you do not have to pay the disputed amount on your credit card statement, but the bank can charge you interest on the amount you don’t pay if it rules against you. (Make sure you pay the undisputed portion of the bill.) If the bank rules in your favor, it will give you a credit for the disputed amount. If it rules against you, you can still seek a refund in court or through other actions, such as by complaining to government agencies. The process for stopping pre-authorized, recurring credit card payments to a merchant is a little different than a credit card dispute. First, write to the merchant, directing it to stop the charges. Second, notify your bank about any charges that you feel were in error. You may be required to submit your dispute in writing or to explain it in a form the card issuer will provide. See the sample letter and sample email. Copy and paste the text, or download these as plain text files, and insert your own information. In your letter or email, include your name, address and phone number. Note what you are complaining about, when and where the purchase or agreement took place, and any other pertinent information, such as the item’s make, model or serial number, or your account number. Briefly and clearly describe the problem, ideally in 250 words or less, and what you want done to resolve it. Give a specific period of time in which a response must be received (such as 10-14 days), and indicate that you will seek legal advice or take other steps if the matter is not resolved. You need not tell the party exactly what you will do. Keep a copy of all communications and supporting documents. Sometimes your only alternatives may be to hire a lawyer or drop the matter. If you believe your best option is to sue, but the amount is more than the small claims court limit or the case cannot be pursued in small claims court, you may have to hire a lawyer. However, most consumer cases do not involve enough money to make it worthwhile to hire a lawyer. You may not be able to locate one who is willing to help you or who is familiar with the legal issues involved. It could be many years before a court decides your case. If you want to speak to an attorney but don’t know how to find one, contact a lawyer referral service. (See Resources, or call your county’s bar association.) If you can’t afford an attorney, ask if your county has a legal aid agency or bar association that can help low-income consumers obtain legal advice. If you are being sued, you definitely need legal advice. Your failure to appear in court or obtain legal advice could be costly. Even if you know that you will lose the case, the advice of an attorney may help you to reduce the amount you will have to pay. You may benefit from having a legal expert read or review a document. If you are about to buy a house or sign a contract, a lawyer can make sure the agreement doesn’t have clauses that could cost you money. It can be helpful just to discuss a matter with a lawyer. If consumer agencies tell you that your only option is to sue, a lawyer can tell you the costs involved and what to expect. In some cases, a letter from a lawyer can resolve the problem. For example, if you have just signed a car contract after being subjected to high-pressure sales tactics, a letter from a lawyer questioning such practices might convince the dealership to cancel the agreement. Small claims court is for the resolution of minor disputes. The rules and requirements for such courts differ widely from state to state, so the first step is to learn the rules for filing a case in your state. Nolo, a legal self-help publisher, offers an online list of small claims limits in every state. Search online or look in your phone book for the telephone number for your local small claims court. Generally, you must file your suit in the city or county in which the business you have the dispute with has an office or in which the transaction took place. There is usually a fee for filing a case. Before you file, learn about the limitations and requirements of small claims court. This includes the maximum amount that you can sue for and restrictions against filing certain types of cases. Nolo offers a free online list of state Statutes of Limitations. Ask the clerk of the small claims court for advice about how to file your case. If you do not file correctly, the case might be thrown out. Give the company a chance to resolve the problem. Before you sue, notify it of your intention to sue by sending a letter. Tell the firm why you feel it owes you money, and the specific dollar amount you want from it. Find out the company’s legal name, and use that when suing it. Formally notify the company of your suit. Ask the small claims court clerk how to do this. Prepare your case. Gather your evidence and consider whether there are witnesses who can testify on your behalf. Practice your presentation by explaining your case to friends. Ask if they can understand your position and think you are making a good case. Be clear and concise. You can visit a small claims court before your court date. Watching other people appear before the judge could make you feel more comfortable about the process. Usually, the judge will first ask you, the plaintiff, to speak, followed by the defendant. Then the judge will ask questions and consider the evidence. Even if you win your case, there is no guarantee you will get your money. If the person refuses to pay, then you may have to take steps to force payment. Ask the court clerk how to do this. For more about small claims court, go online to read the questions and answers offered by Nolo, or obtain a copy of “Everybody’s Guide to Small Claims Court” by Ralph Warner, published by Nolo. Check your public library for a copy before purchasing the book. Many states offer community or court-based mediation designed to help disputing parties arrive at their own compromise settlement with the help of a neutral third party. The National Association for Community Mediation offers a program locator to help you find community mediation programs near you. Better Business Bureau: Complain about businesses. Consumer Action: Call (415-777-9635) or send a webmail for advice and referrals. Access free, multilingual brochures. Consumer Financial Protection Bureau (CFPB): Submit complaints about credit cards and other financial services. Consumer Product Safety Commission (CPSC): Submit and review consumer product safety complaints. Federal Communications Commission (FCC) (Complaint form): Submit landline and wireless phone complaints as well as those related to telemarketing, broadband (Internet) and TV broadcasting. Federal Trade Commission: Submit complaints about unfair or deceptive business practices, fraud, scams, credit reports and collections abuse. Financial Industry Regulatory Authority (FINRA): Submit complaints about an investment or financial advisor or brokerage under FINRA’s mediation program. Help With My Bank (Comptroller of the Currency): Submit complaints about national banks (with “National” or “NA” in or after the name). Legal Services Corporation: Find legal assistance for low-income individuals and families. National Association of Attorneys General (AGs): Find your state AG’s office to make a complaint of fraud or unfair business practices. National Association for Community Mediation: Find a local mediation organization. National Association of Consumer Advocates: Search by location and specialty to find a consumer attorney. National Association of Insurance Commissioners: Find your state insurance regulator to submit insurance-related complaints. National Motor Vehicle Title Information System (NMVTIS): Access important vehicle history information. Securities and Exchange Commission (SEC): Submit investment-related complaints. 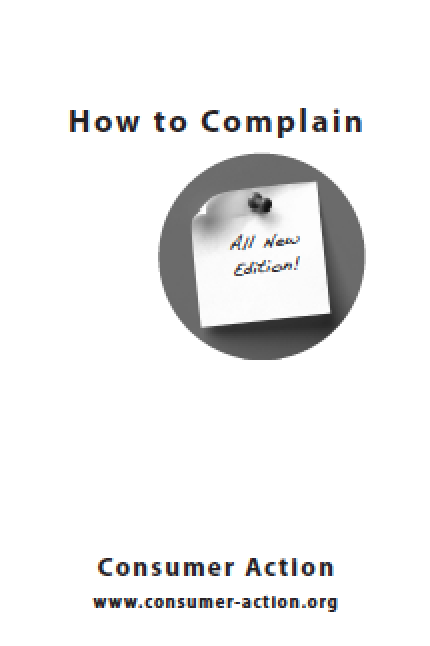 Consumer Action Handbook: Get this free resource for helping you complain effectively. I wish to complain about ____ (name of product or service, with serial number or account number) that I purchased on ____ (date and location of transaction). I am complaining because ____ (the reason you are dissatisfied). To resolve this problem, I would like you to ____ (what you want the business to do). When I first learned of this problem, I contacted ____ (name of the person, date of the call) at your company and was told that nothing could be done about my problem. I believe that this response is unfair because ____ (the reason you feel the company has an obligation to you). I would like a written statement explaining your company’s position and what you will do about my complaint. I look forward to hearing from you as soon as possible to resolve this problem. If I do not hear from you within ____ days, I will file complaints with the appropriate consumer agencies and consider my legal alternatives. I am enclosing copies of my_____ (receipt or other proof of payment or documentation of complaint). I may be contacted at the above address/phone number. I look forward to hearing from you as soon as possible to resolve this problem. If I do not hear from you within ____ days, I will file complaints with the appropriate consumer agencies and consider my legal alternatives. I am attaching copies of my_____ (receipt or other proof of payment or documentation of complaint). You may reply to me at this email address or call me at (phone number). Note: You can download text files for the sample letter and email on our website. Consumer Action is a non-profit organization that has championed the rights of underrepresented consumers nationwide since 1971. Throughout its history, the organization has dedicated its resources to promoting financial literacy and advocating for consumer rights in both the media and before lawmakers to promote economic justice for all. With the resources and infrastructure to reach millions of consumers, Consumer Action is one of the most recognized, effective, and trusted consumer organizations in the nation. Financial Education. To empower consumers to assert their rights in the marketplace, Consumer Action provides a range of educational resources. The organization’s extensive library of free publications offers in-depth financial information, while its hotline provides non-legal advice and referrals. Consumer Action also publishes unbiased surveys of financial and consumer services that exposes excessive prices and anti-consumer practices to help consumers make informed buying choices and elicit change from big business. Community Outreach. With a special focus on serving low- and moderate-income and limited-English-speaking consumers, Consumer Action maintains strong ties to a national network of nearly 7,500 community-based organizations. Outreach services include training and free mailings of financial education materials in many languages, including English, Spanish, Chinese, Korean and Vietnamese. Consumer Action’s network is the largest and most diverse of its kind.